The Olive Garden Angry Alfredo dipping sauce is a new appetizer you can get from the Olive Garden. The version served at my local restaurant was served with grilled chicken. I have a confession to make to you, hands down the Olive Garden is my favorite restaurant. I know, we all have our guilty pleasures, and for me the Olive Garden and their irresistible Alfredo sauce is my kryptonite. Honestly, it is how my journey in copycat recipes began. I lived in the country in East Texas, and when we went into Houston for a meal out, I tasted Alfredo sauce for the first time, and I had to recreate this recipe. So when their appetizer menu featured a new recipe for the Angry Alfredo sauce, well I had to give it a try. Needless to say, I was hooked. What made this recipe really good was the sauce was creamy and filled with all sorts of grilled chicken. For my low carb and keto friends, this is the appetizer you can enjoy at the Olive Garden. The grilled chicken was grilled, if you can’t grill your chicken, you can pan sear it and it will work just fine. I know all of us can not grill all year around. I find that if you can’t grill the chicken if you sear it in an iron skillet pan your result will be wonderfully browned chicken. The ingredients for this recipe are very straightforward. This is really a combination of their famous alfredo sauce with some hot chili pepper and some grilled chicken. They serve this with some lightly toasted baguette. 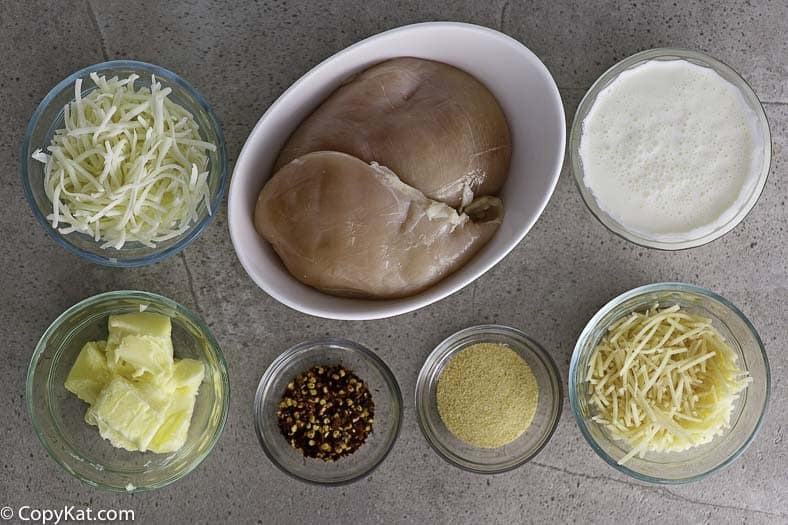 You will also need some Parmesan, cream, butter, chicken, and mozzarella cheese. Try one of the newer Olive Garden Appetizers, the angry Alfredo sauce has just the right amount of spice. In a medium-sized saucepan, heat the butter over medium-high heat allow the butter to melt but do not let it brown. Add the heavy cream, and when it begins to bubble add the cheese and stir until the sauce thickens. Reduce the temperature down to simmer. Add the crushed red peppers and the garlic powder. Season the chicken with salt and pepper. In a medium-sized skillet preferably an iron skillet heat over medium-high heat, and add a couple tablespoons of olive oil. Cook chicken for 5 to 7 minutes or until the edges of the chicken begin to turn white, flip chicken breast over and continue to cook until done. The chicken should cook for approximately another 5 to 7 minutes. Preheat your oven to broil. Allow the chicken to rest for a couple of minutes, and then slice into bite-sized pieces. Combine the Alfredo sauce and the chicken. Place into a 1-quart casserole dish. Top with mozzarella cheese. Place casserole dish under the broiler and allow the cheese to brown. When the Mozzarella cheese just begins to brown remove from the oven. 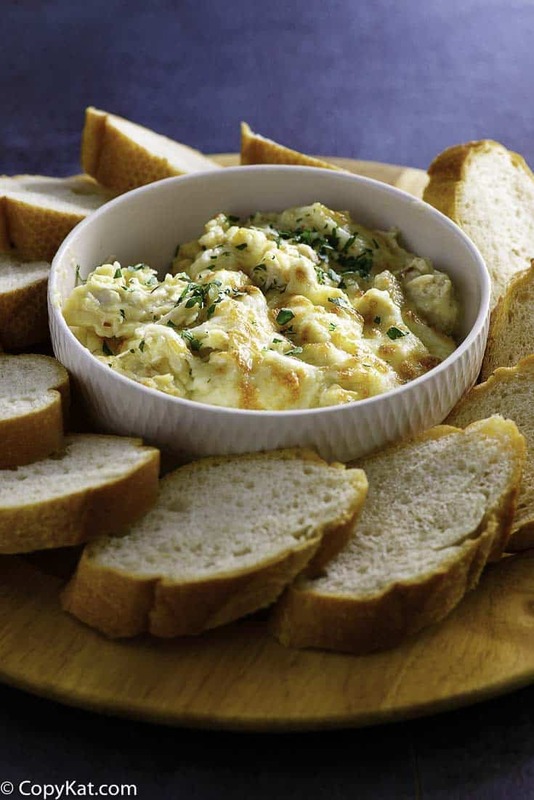 Serve with slices of baguette bread. I would love to get some more of your copycat recipes! It looks like a divine and delicious dish.Thank you for giving a finest share. I am a regular follower of this blog. This was delicious! As we are trying to go low carb, we ate it without the bread. Definitely a do again! This recipe is definitely low carb and keto friendly. Wow. I make this all the time, except I use fresh Parma cheese instead of Mozerella! Who knew Olive Garden was copying me! ????????. Delish!